Spinner S5 Indoor Cycling Bike is a spin bike for the home based on commercial bike design. It has the traditional look of these bikes. The bike comes with dual pedals and 4 spinning DVDs that don’t see with most bikes in the price range. As well as those features it has an adjustable seat (up/down and backwards/forwards,. handlebars that can be move up/down. So the bike can be fitted to and used by multiple people to get the benefits of a spinning workout or training..
And it has a 31 lbs perimeter weighted flywheel to help provide a proper pedal stroke. In my review I take a look at whether the creators can produce a bike that is good for home use. A bike at home might not get the use at a gym but you still want a quality bike to be able to use when you want. To start here is a look at how stable and durable the bike is going to be. Despite its narrow width – 18 ins, the bike will hold you steady as you workout. The steel frame won’t be bending or flexing as you workout as push hard against the resistance in or out of the seat. You can just get on with getting the workout you want without being concerned about being tipped off. Under the stabilizer bars are 4 stabilizing feet that you can quickly turn to stop the bike from rocking side to side due to variability in the floor. The bike comes with a 1 year warranty which is probably about average for bikes in this price range. The experience with other Spinner bikes are that they are on the whole durable and I’d expect the same from this bike too. The bike seat can be moved horizontally and vertically and the handlebars can be moved vertically to fit the bike correctly for people between the heights of 4 ft 10 ins and 6 ft 7 ins based on the company’s recommendation. Making the adjustments is easy and straightforward. It is using the adjustment knobs on the adjustment poles or slider – loosen them pull them to release the pull-pin and slide them seat/handlebars into position re-insert the pull-pin into the closest pre-set pin and then tighten back up to hold firmly in place. The adjustment poles have markings on them to make it easy to return to your setting if it has been moved since you used the bike. The process only takes seconds so doesn’t get in the way of starting a workout. 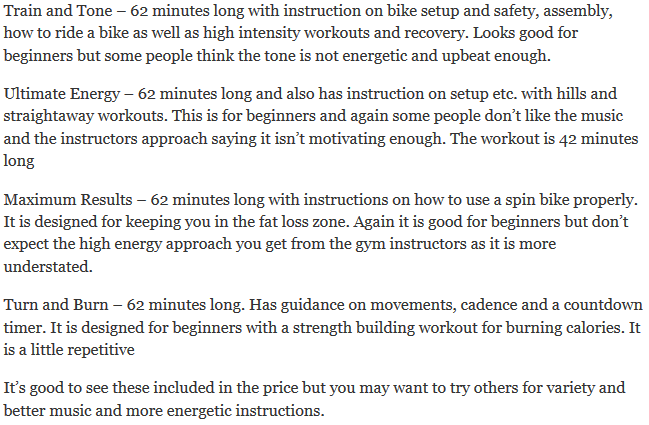 This makes it possible for multiple people to use the bike for low impact cardio workouts. The use or pres-set holes and that the handlebars can’t be adjusted backwards and forwards does mean some people may find that they can’t quite get the most comfortable fit for them. The lack of horizontal adjustment may have them feeling they are stretching more than they like or feeling cramped up. Making the turns are easy and resistance increases/decreases gradually so there is plenty of scope to set it at the amount you want. As with many spin bikes there aren’t any levels marked to guide you. You have to do this by feel and estimate. This is standard with marked levels being the exception rather than the rule (a bit like a hill – you don’t know it’s slope exactly?). The pad will wear down from use in about a year’s time (dependent on usage) and need replacing. There are instructions in the manual and pads can be sourced from the supplier. The resistance and flywheel have a guard on the frame that protects them from sweat to keep the rust away. The chain drive works in the same way as the ones you find on a road bike (except no gear changes). It helps to make the bike feel more like a bike with the same slight vibration and low noise as the chain moves across the sprocket. It does have similar requirements for maintenance too. But should be much less frequent because it’s not out in the weather and it doesn’t have to cope with those gear changes. The maintenance required that may be needed over time is adjusting the chain tension, cleaning and lubricating. The instructions to do this are included in the manual. The chain has a guard which can help to keep it from being damaged, keep out dust and keep it out of reach of ankles, pets and children. To keep the strokes smooth it has a 31 lbs perimeter weighted flywheel to help pull the pedals through the whole 360 degree stroke. It will fairly natural through all amounts of resistance except at the higher levels of resistance where you may notice the pedals slowing as the resistance starts to work as a brake. The bike has a fixed gear which means that you can’t coast – when the weighted flywheel is turning so are the pedals. To stop them you should either gradually slow down or push down on the resistance knob to use it as a brake to stop immediately if you need to get in a hurry. The dual sided pedals screw in to a 3 piece crank for a strong solid pedaling in or out of the seat so there is no flexing or slipping. On one side of the pedals are toe cages and straps for using with athletic shoes. You can adjust the strap to fit your shoe size to get the best grip on the pedals. On the other side is an SPD compatible pedal for using with your specialist shoes. If you want you can change the pedals for your own as the cranks take a standard thread. Seat. It has a wide padded seat to provide more comfort and easier balance. Like all bike seats some people will like the seat, but not everyone is going to be a fan. Some people may find that the seat is too painful to get a good decent workout. There are some things you can do – the first is to check the seat is properly adjusted (the manual does help with this. Over and above that you can try padded bike shorts or gel seat cover. And if it is still too much you can replace the seat with any other standard bike fitting seat that is more for your liking. Handlebars. The handlebars have a larger diameter and are covered for a more comfortable grip to prevent slipping and blisters when your hands become wet from sweat. They have the standard design with bullhorns and small loop at the center for more support. It doesn’t come central bars for the aero position but all the spinning grip positions are covered. Noise. The bike isn’t going to be silent due to friction pad and the chain drive. It’s not really noisy (like a road bike), it’s just not quiet like the bikes with a belt drive or magnetic resistance. If you want to watch TV you may need to turn it up a little. However, people in another room are unlikely to be disturbed too much during the day. Cleaning Up. There will be some dust generated by resistance pad and may be a little lubricant dropped from the chain. But the biggest thing that needs cleaning up is likely to be sweat. It is very corrosive. To keep the bike looking good and performing well it needs to be cleaned up. The bike has rust proofing and guards to help with keeping the bike protected. Also you may want to put the bike on a rubber exercise mat to stop it being damaged from sweat and lubricant. The bike needs an area of 18 by 43 ins which is quite compact for a spin bike but still makes it too big for a closet. It has a good traditional look so won’t look too bad against a wall and won’t take up too much room there. The flywheel is not enclosed so that can be safety issue with young children as they may turn the pedals. It doesn’t come with a safety strap, so to help to stop them getting injured it is a good idea to turn the resistance up so the pedals or wheel can’t be turned. There are two small wheels at the front for moving the bike. To use them you need to tip the bike forward on to them. Note the bike weighs 96 lbs. It’s not difficult to do this and wheel the bike you want to go. Most of the weight of the bike is at the front and wheel support this. You just need to navigate and roll the bike where you want it to go. The wheels are fairly wide apart so there shouldn’t be an issue with it toppling but care should be taken all the same. The bike comes partly assembled when delivered. It is possible to assemble it in about 1 to 2 hours with some able to do it in less. The most difficult parts of the assembly have already been done. You are required to add the stabilizer bars, pedals, adjustment posts, handlebars and seat. The hardest part of the job is probably handling the weight of the box and bike and you might find it all goes easier with having a second person to help with holding parts in place etc. It comes with the tools needed to complete the job. The instructions are clear. It is much easier than putting together furniture from IKEA. The bike doesn’t come with a console for tracking your workouts. The company does sell a computer separately that fits the bike for between $60 – $70 that measures cadence (RPM), speed, time, distance and calories. It is called Spinning Bio Wireless Computer is available direct from supplier. Some people add Cateye computers to their spin bikes but it does take a little modification to it especially the spoke magnet. They cost about $30 – $40 but they’re not as easy to add as the official computer. I like having a computer on a bike to help me to stay on track and know how far there is left to go. Also, I like having the numbers to be able to see my performance on workouts over time. But it’s not unusual for spin bikes to not include one. Many people prefer not to have one and they can use music and/or a spinning video to keep them on track or just their own knowledge. The bike comes with two accessories – a water bottle holder and a set of 4 spinning DVDs. Having the DVDs is more than most spin bikes or indoor cycles come with – they tend to be minimalist in this regard – leaving you to just get on with exercising without help. The water bottle holder is located towards the bottom of the frame. The bottle is held in by gravity making it easy to get and return so you don’t need to slow down on your pedaling. You may find it gets wet from sweat and you do need to careful of it when getting on and off the bike that you don’t kick it off or stumble over it if you lift your leg through the frame rather than over the back. The 4 DVDs are great for beginners giving workouts to follow along to and information on how to set up and look after the bike properly. At present there are no customer reviews to read and check on customer experience. It is a new bike, so we’ll have to wait and see. As and when there is a review or two etc left I’ll come back and update this section. But for now all there is to go on is customer experience from other Spinner models. They do have a number of bikes ranging from home models to commercial models and overall they are well regarded by customers. There’s nothing to suggest this new model will be any different. For the price you get a good solid spin bike for home use. You get dual pedals for athletic and SPD shoes and a set 4 workout DVDs which is not something you get at this price with other brands. 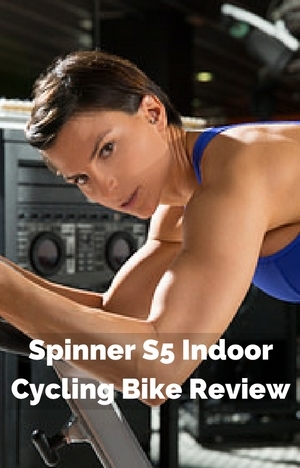 The Spinner S5 Indoor Cycling Bike is a good bike for beginners and intermediates wanting to get their cardio training in at home. It provides a good stable base that can be easily fit to the exerciser for the most effective workout. Resistance level is easy to adjust to get it to the intensity to you want to train at and adjust as you go. I’d like if better if it at least had a basic console include to help me to stay on track but for many they can do that with music or following along to a training DVD. The perimeter weighted flywheel provide a reasonably smooth pedaling motion that pulls the pedals through the 360 degree motion. You can use normal athletic or SPD shoes. It provides a good solution for spinning and training indoors to help work on your cardio fitness without having to go to the gym or get outdoors when the weather is against you.